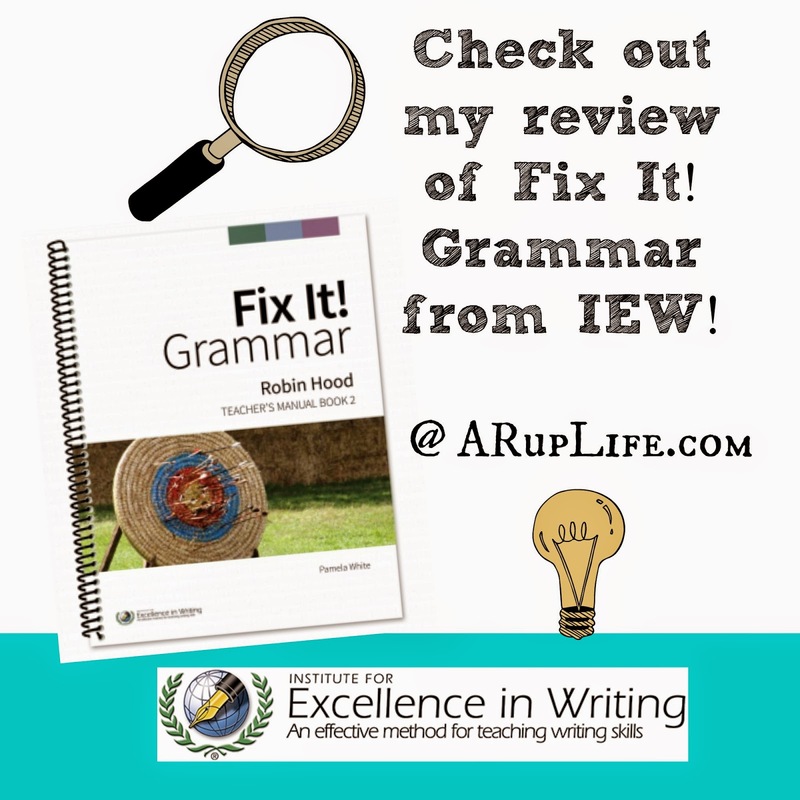 We have been using Institute for Excellence in Writing (IEW) for grammar for the past few weeks. IEW is well-known for their writing curriculum and founder Andrew Pudewa. I've had the privileged of using their writing curriculum in the past as well as seeing Mr. Pudewa speak several times. Fix It! Grammar is a daily grammar activity for students. There are 6 books in the series and it can be used for grades 3+. Students work on correcting book passages each day. The mark punctuation, parts of speech and more. After four days of correcting work they then, on the fifth day, re-write the week's passages. At completion of the grammar course they will have written out the entire work of literature. There are flashcards in the back of the book for reviewing. This course was used with my 9th grader. He worked daily on the passages. On the first page of the week the student book has information in the "Learn It" section. This covers what they students will need to be marking on the daily passages. He was required to review this material and come to me if there were any questions. Each day he would then complete the passage work. This was marking punctuation, labeling parts of speech and vocabulary. For vocabulary we had a separate notebook where he would write out the vocabulary word and look it up in the dictionary, copying the definition. It took him about 10 minutes a day to complete each task. Grading was very easy for me. The Teacher's Manual was very detailed. I grade on day 4 then have Austin do his re-write on Fridays (Day 5). We didn't really do much with the flashcards at the back - so far. I kept them intact so that we would lose them. For now I just had my son review them from there but for the most part he knew all the concepts. However I have a feeling that we will use them more in the upcoming weeks. This program was recently revamped. We had the previous version but never implemented it. I can see that the changes were very timely because the curriculum is much easier to get started with and use. I was very pleased overall. The teacher's guide was easy to use and added helpful additions. I am personally not very good with grammar so I dread teaching it - however the guide tells you more advance material. So if your student is already marking those things you can keep him at a more advance level. (Such as when a noun might be a verb in a sentence). I also liked how little time this program took. I personally like grammar to be a quick lesson so that they can move onto more interesting subjects like History or Science. 10-15 minutes is a very doable lesson time. This means no complaints from my kid who would rather be done his work entirely and outside enjoying the day. Another plus was that my son liked this program. In the past he has complained about grammar work. He tires of the same thing over and over. I feel like IEW changes that because you are actually reading a story bit by bit each day. I think that really adds to the appeal for the students. One of struggles we had with this program was indentation. I feel like it is really hard to know when to indent when you are only seeing one sentence at a time (or four on the weekly page). So for that I am just marking the indentation for him so when he re-writes he will know when to indent the next paragraph. It isn't really a big deal in the whole scheme of things so we both agreed it was easier if I just helped him along. I told him to take a guess and he has been trying to figure it out. I had a bit of a struggle figuring out placement for my son. He has a strong background in grammar so the first book was too easy for him. This book has been on the easy side so far but we are only a few weeks in. As we get into harder concepts (more clauses and such) I know he will be learning new things so I'm pretty confident that I picked the correct level. The placement test online starts you mid-book so that gives you a glimpse at what you will be learning further down the road. I think we could have started with book 3 - but I was worried that starting a whole new program might have a learning curve and wanted to start on the easier end rather than being overwhelmed in a higher book. Overall I am very pleased and we will continue use this curriculum this year with my oldest son. He is enjoying it and that is really the most important factor for me at this time.